Hi! I'm Lauren - author, photographer, traveler, medical assistant, country dweller and Young Living member. I am passionate about providing clean, wholesome books for young readers that will not only entertain, but uplift and instruct. Amy Kentworthy is a Christian teenager living during the 1920’s, on the Bar Double Diamond Ranch in Durango, Wyoming. As you follow Amy through her life, you will see how her faith in God helps her through the many trials, changes and dangers that come her way. Can they bring help in time to stop the rustlers and save the cattle? Will Amy’s faith provide her with the courage she needs to face the very same thieves who dared to steal hundreds of cattle? Join Amy in this exciting western adventure as she learns valuable lessons on life, family, and the faith it takes to make it in a ranchin’ world. "I picked this book up at a book show just because it had a horse on the cover. It is obviously intended for teens. I am gray-haired but thoroughly enjoyed it. The story was not predictable. There were many surprising turns in the plot. The characters were all likeable, except for the rustlers, of course. Lauren Lotter has a very pleasant voice, easy-to-read and understand. There was much kid humor (pouring cold water over sleeping friends) which kept the book from becoming too serious in spite of presenting realistic rough life on a ranch in the 1920's in Wyoming. It is definitely Christian with many prayers included in the main characters thoughts. A delightful read." Amy Kentworthy is ready to settle back into normal ranch life on the Bar Double Diamond after a six month long cattle drive to Texas. However, her father, Clint, invites a sweet Christian lady named Jessica, who they met on the cattle drive, to visit the ranch. Amy senses she may be getting a new mother and three new siblings in the near future and struggles with her emotions. In the meantime, Amy's great uncle passes away, leaving his large estate to her. They are informed of a hidden treasure and are in a race against time and some unscrupulous men to locate it. Will Amy and her friends be able to figure out the clues Uncle Nathan cleverly created and thwart the thieves plans? What are Clint's intentions toward Jessica and what will her arrival mean for the future of Amy and the ranch? Join Amy and her friends as they embark on this new adventure! "What a delightful book! This will be great for my 7-14 year olds. (I have 5, boys and girls) It has mystery and adventure and Amy, the main character, is wonderful. I would like to meet her! As a Mom, I love how Amy's faith is real. There is nothing forced in the message, it is simply Amy, a young Christian lady, who lives out her faith in all that she does. It is a quick read and the illustrations are beautiful too!" ​Rachel’s family raises purebred Quarter Horses, but, even though she is surrounded by beautiful horses, she still longs for a horse for her own. And, when her dad takes her to a local auction, she only has eyes for one horse – and one horse alone. A terrified mare tries to hide her fear beneath a hardened exterior, but Rachel knows better. Everything within her knows that they were meant for each other. Once they get her home, the challenge is on. Can Rachel convince a frightened, abused animal to trust again? Will the mare ever overcome her fear? And why is Ralph, a mysterious and dark-hearted stranger, so determined to steal the mare away? Join Rachel and her family as they struggle to teach trust and love to the beautiful grey mare. Will they ever succeed? And will Rachel ever find the perfect name for her? "This moving, well-crafted story is appropriate for all ages, but I especially recommend it for younger teens who love horses! Anyone with a heart for animals and a special love of horses will enjoy this tale. Learn the steps to gentling and winning the confidence of an abused horse through the story of a girl who believes in her horse and won't give up. What happens when you throw a vicious animal abuser into the mix? Well...you'll have to read the book to find out! Recommended for homeschoolers, animal lovers, and teen girls." After being involved in a terrible accident, Bethany is determined to have nothing to do with horses, but when Rachel rescues a traumatized gelding named Thunder, Bethany struggles to keep her resolve. Something about the black horse intrigues her. Rachel is determined to get Bethany interested in the horse, but Bethany is determined to ignore the attraction she feels for the gelding, convinced that all horses are dangerous and unpredictable. 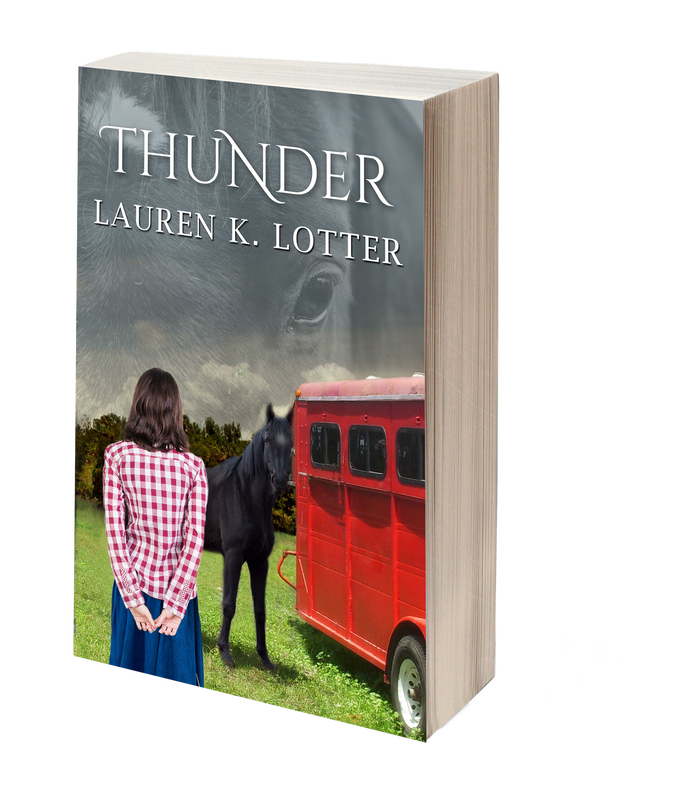 Thunder refuses to connect with Rachel and in desperation, she convinces Bethany to try join-up with the gelding. After months of rehabilitation, Bethany has healed physically but emotionally she is still fragile. Can she put her fear aside and help Thunder? Adah's world is turned upside down by the sudden death of her fiancée. After years of declaring that she will always be single, David broke down her walls and she fell hopelessly in love. But just three weeks before their wedding, he is killed in a car accident. A happily-ever-after ending becomes a distant dream. Adah is lost without him and she tries to drown her grief in a crazy social life, but finds no peace. In desperation, she heads off into the mountains, searching for a cure for her broken heart. Her lack of wilderness experience gets her into many predicaments as she attempts to live life as the pioneers did. No running water, no electricity, a rock slide, an uncooperative wood stove and an unexpected late spring blizzard nearly overwhelm her. As if that wasn't adventure enough, a nearly frozen man appears on her doorstep in the middle of the raging blizzard. Adah is shocked to discover a young child cradled in his arms. While the little girl, Sarah, seems unharmed, Adah works desperately to save the man's life. With limited medical knowledge, she does the best she can, but a high fever and other injuries threaten his life. The man, whose name is Ethan, regains consciousness and seems to be recovering just as the storm abates. But flooding, mud slides and avalanches force the trio to remain in the cabin for the unforeseeable future. Adah is disturbed by Ethan's talk of God. Raised to be an Atheist, any talk of religion bothers her. But the more Ethan speaks of his God, the more curious Adah becomes. Something about the relationship Ethan has with his God calls to her. It is more than just a religion. Could God be the answer? Can He heal her broken heart? Join Adah in her search for the truth. Will she finally find the love she has been searching for all her life? in word, in conversation, in charity, in spirit, in faith, in purity."